November 11, 2005–Full Impact Pro: Shane Hagadorn joined the faction known as DP Associates led by manager Dave Prazak..
~~~DP Associates (Austin Aries & Adam Pearce & Shane Hagadorn) defeated Chasyn Rance & Seth Delay & Altar Boy Luke..
January 14, 2006 – Ring of Honor: Derek Dempsey defeated Shane Hagadorn and Smash Bradley and Pelle Primeau in a dark match..
January 27, 2006 – Ring of Honor: Shane Hagadorn defeated Rhett Titus in a dark match..
February 11, 2006 – Ring of Honor: Derek Dempsey defeated Shane Hagadorn in a dark match..
March 31, 2006 – Ring of Honor: Ricky Reyes defeated Delirious and Flash Flanagan and Shane Hagadorn in a 4-WAY..
April 22, 2006 – ROH: Pelle Primeau beat Hagadorn & Bobby Dempsey & Smash Bradley & Mitch Franklin & Matt Turner in a 6-WAY..
April 29, 2006 – Ring of Honor: Shane Hagadorn defeated ????? and ????? and ????? in a 4-Corner Survival match..
June 3, 2006 – Ring of Honor: Shane Hagadorn defeated Derrick Dempsey by Submission to win the Top of Class Trophy! June 17, 2006 – Ring of Honor: Shane Hagadorn defeated Mitch Franklin to retain the Top of Class trophy..
June 23, 2006 – Ring of Honor: Irish Airborne (Jake & David Crist) defeated Shane Hagadorn & Keith Walker..
June 24, 2006 – Ring of Honor: Irish Airborne (Jake & Dave Crist) defeated Shane Hagadorn & Trik Davis..
July 29, 2006 – Ring of Honor: Shane Hagadorn defeated Egotistico Fantastico in a dark match..
August 4, 2006 – Ring of Honor: Shane Hagadorn defeated ?????? to retain the Top Of The Class Trophy..
August 5, 2006 – Ring of Honor: Shane Hagadorn defeated Bobby Dempsey in 5 seconds after using a foriegn object..
August 26, 2006 – Ring of Honor: Shane Hagadorn defeated Pelle Primeau to retain the Top of the Class Trophy..
September 15, 2006 – Ring of Honor: Delirious defeated Shane Hagadorn by Submission..
September 16, 2006 – Ring of Honor: Adam Pearce defeated Delirious with help from his new assistant Shane Hagadorn..
October 6, 2006 – Ring of Honor: Shane Hagadorn defeated Pelle Primeau to retain the Top of Class Trophy..
October 28, 2006 – Ring of Honor: Adam Pearce & Shane Hagadorn defeated Irish Airborn (David & Jake Crist)..
November 3, 2006 – Ring of Honor: Shane Hagadorn defeated Pelle Primeau to retain the Top of the Class Trophy…. November 4, 2006 – Ring of Honor: Ricky Reyes defeated Shane Hagadorn by Submission..
~~~Team Dragon = American Dragon & Davey Richards & Steve Madison & Shane Hagadorn & SHINGO Takagi..
November 18, 2006–CHIKARA: Fire Ant & Worker Ant & Soldier Ant defeated Shane Hagadorn & Pelle Primeau & Rhett Titus..
November 24, 2006 – Ring of Honor: Shane Hagadorn defeated Rhett Titus in a dark match..
November 25, 2006 – Ring of Honor: Shane Hagadorn defeated Bobby Dempsey to retain the Top of Class Trophy! December 8, 2006 – Ring of Honor: Delirious & “Crazy” Ace Steel defeated Adam Pearce & Shane Hagadorn..
December 9, 2006 – Ring of Honor: Homicide defeated Shane Hagadorn..
December 5, 2006–East Coast Wrestling Association: The Valedictorians (Rob Eckos & Billy Baxx) won a 4-WAY Tag match..
~~~The Valedictorians beat Aden Chambers & Andrew Ryker and Kid Mikaze & Jason Blade and Shane Hagadorn & Pelle Primeau..
January 7, 2007–WORLD-1: Kirby Mack won a 6-WAY to recapture the AWA World Light Heavyweight title..
January 13, 2007–Full Impact Pro: Black Market beat Kenny King & Chasyn Rance and Shingo & Shane Hagadorn in a 3-WAY! January 26, 2007 – Ring of Honor: Delirious & Pelle Primeau defeated Adam Pearce & Shane Hagadorn..
February 17, 2007 – Ring of Honor: Shane Hagadorn defeated Alex “Sugarfoot” Payne to retain the Top of Class Trophy..
February 23, 2007 – Ring of Honor: Shane Hagadorn defeated Ernie Osiris to retain the Top of Class Trophy..
April 14, 2007 – Ring of Honor: Pelle Primeau defeated Shane Hagadorn to win the Top of the Class Trophy! May 11, 2007 – Ring of Honor: “American Dragon” Bryan Danielson defeated Shane Hagadorn by Submission..
August 10 – ROH: Shane Hagadorn defeated Alex Payne and Rhett Titus and Bobby Dempsey and Mitch Franklin and Ernie Osiris..
September 14, 2007 – Ring of Honor: Shane Hagadorn defeated Kyle Durden in a dark match..
November 3, 2007 – Ring of Honor: Austin Aries defeated Shane Hagadorn (after Hagadorn issued an open challenge)..
December 1, 2007 – Ring of Honor: Adam Pearce & Shane Hagadorn defeated Alex “Sugarfoot” Payne & Ernie Osirus..
January 12, 2008 – Ring of Honor: HANGMAN 3 (B.J. Whitmer & Shane Hagadorn) defeated Bobby Fish & Eddie Edwards..
January 26, 2008 – Ring of Honor: Shane Hagadorn defeated Pelle Primeau after the use of brass knuckles..
March 15, 2008 – Ring of Honor: The Vulture Squad (Ruckus & Jigsaw) defeated Adam Pearce & Shane Hagadorn..
~~~Adam Pearce, Brent Albright, and Shane Hagadorn joined Sweet & Sour Inc. but B.J. Whitmer went out on his own..
~~~B.J. Whitmer QUIT the HANGMAN 3 so Adam Pearce & Shane Hagadorn took him out B.J. Whitmer with a Spike-piledriver! March 22, 2008–Full Impact Pro: Erick Stevens defeated Shane Hagadorn…. 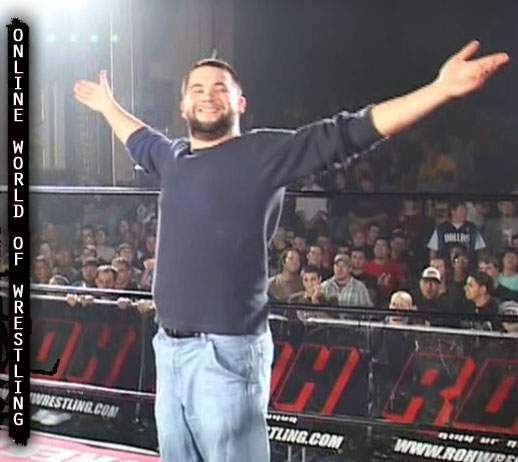 July 26, 2008 – Ring of Honor: Erick Stevens defeated Ruckus and Delirious and Shane Hagadorn in a 4-Corner Survival..
August 1, 2008 – Ring of Honor: The Briscoe Brothers defeated Sweet & Sour Inc. (Adam Pearce & Shane Hagadorn)..
August 16, 2008 – Ring of Honor: Roderick Strong faced five members of Sweet & Sour Inc. in a Gauntlet Match..
~~~Strong beat Bobby Dempsey | Strong beat Shane Hagadorn | Strong defeated Adam Pearce | Strong beat Chris Hero by DQ..
~~~~~~~~~~~~~~~~”Sweet & Sour” Larry Sweeney defeated Roderick Strong after three knockout punches from Chris Hero..
September 20, 2008 – Ring of Honor: Adam Pearce defeated Brent Albright to recapture the NWA World Heavyweight title! ~~~The post-match celebration was highlighted by the disturbing sight of Adam Pearce and Shane Hagadorn kissing! November 8, 2008 – Ring of Honor: Erick Stevens & Roderick Strong defeated Go Shiozaki & Eddie Edwards w/Shane Hagadorn..
April 18, 2009 – Ring of Honor: Shane Hagadorn began managing ROH World Tag Team champions the American Wolves ..
~~~Davey Richards & Eddie Edwards w/Shane Hagadorn vs. American Dragon & Tyler Black ended in a 45:00 time limit draw..
April 24, 2009 – Ring of Honor: Colt Cabana defeated Chris Hero w/Shane Hagadorn in a singles match..
April 25, 2009 – Ring of Honor: Tyler Black defeated Chris Hero w/Shane Hagadorn in a singles match..
May 9, 2009 – Ring of Honor: Chris Hero w/Shane Hagadorn defeated Sonjay Dutt in a singles match..
May 29, 2009–ROH HDTV Taping: Jerry Lynn defeated Chris Hero (w/Sara Del Rey & Shane Hagadorn) to retain the ROH title..
~~~The American Wolves & Chris Hero (w/Sara Del Rey & Shane Hagadorn) defeated KENTA & Kevin Steen & El Generico..
September 26, 2009 – Ring of Honor: The American Wolves w/Hagadorn defeated Kevin Steen & El Generico in a Ladder match! April 4, 2011–ROH TV: The Briscoes & Davey Richards defeated Kings of Wrestling w/ Sara Del Rey and Shane Hagadorn and Roderick Strong w/ Truth Martini. May 20, 2011–Supercard of Honor: El Generico defeated Chris Hero with Shane Hagadorn. Shelton Benjamin defeated Claudio Castagnoli with Shane Hagadorn. September 24, 2011–Future Shock: Charlie Haas & Shelton Benjamin defeated The Kings of Wrestling (Chris Hero & Claudio Castagnoli) w/ Shane Hagadorn & Sara Del Rey to retain the titles.